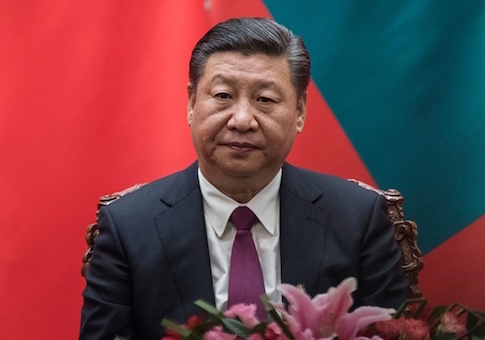 The Chinese government claims to guarantee religious freedom to its citizens, but evidence continues to mount that President Xi Jinping is carrying out the greatest persecution of Christians in the country since the days of Mao Zedong. A new report from the Associated Press shows the Chinese government is increasingly hostile to Christians even as it cracks down on other religious groups across the nation. With an officially atheist government that wrote religious freedom into its constitution in 1982, China has long had an uneasy relationship with religious believers, but Xi is now implementing a five-year plan to "Sinicize" Christian churches. "Siniciziation" has traditionally been used to describe local adoption of religions imported from foreign regions, but under Xi the term has gained new meaning. Xi's guidance demands China "actively guide religions to adapt to the socialist society," according to The Diplomat. The plan has led to crackdowns on churches that Christians say is "unprecedented" as local government agents have shut down hundreds of house churches in recent months, the AP reports. An article published by the religious affairs department in April told Christians, "Only Sinicized churches can obtain God’s love." This push comes after the number of religious believers doubled to 200 million over the last two decades, in what experts call a Chinese spiritual awakening. A third of those are Christians—Uighur Muslims and the Falun Gong are other prominent groups who face their own persecution—and church leaders say the government is demanding they stop assembling. "I’ve always prayed for our country’s leaders, for our country to get stronger," said Guo, a shopkeeper who did not reveal his full name for fear of state retribution. "They were never this severe before, not since I started going to church in the 80′s. Why are they telling us to stop now?" In March, Chinese police officers came to Guo's brick church in Henan province and forced its congregants to disperse, demanded them to register with the government, and ordered the removal of a cross and biblical images, which Guo has refused to do. Guo was asked to report on congregants' personal information, church attendance, and whether they had been baptized. The congregation dwindled after the police crackdown intimidated members. Christian churches have been expected to emphasize loyalty to the party and put symbols of the Communist Party in meeting places, such as replacing pictures of Jesus Christ with those of Xi. Chinese officials refer to this political indoctrination as "thought reform" and emphasize Christians would be better off economically by dropping religious dogmas. Yugan county’s Huangjinbu township alone enforced "thought reform" measures on hundreds of churches. "Through our thought reform, they’ve voluntarily done it," local official Qi Yan said about people replacing pictures of Christ. "The move is aimed at Christian families in poverty, and we educated them to believe in science and not in superstition, making them believe in the party." Xi’s campaign against religion dovetails with his sweeping program of domestic surveillance. Churches are expected not just to register with the state but to consent to being constantly monitored by police, even as the state has a record of jailing missionaries and pastors such as Rev. John Cao, a Chinese citizen and American permanent resident. In March of 2017, Cao was arrested by Chinese border patrol forces while attempting to return to China. He was convicted of a crime typically reserved for human traffickers and received a seven-year prison sentence. Since being detained, his wife says, his health has declined rapidly and he has not been allowed to communicate with his family. Zion Church in Beijing saw hundreds of its members individually questioned by police when pastor Jin Mingri refused to allow surveillance cameras inside his house church. Jin said authorities made veiled threats and asked many to sign a pledge to leave the church, which they called an illegal, politically incorrect cult. "A lot of our flock are terrified by the pressure that the government is putting on them," he said. "It’s painful to think that in our own country’s capital, we must pay so dearly just to practice our faith." This pressure comes from the top, according to experts, who consider Xi an heir to Mao’s legacy of authoritarian thought control. "Xi is a closet Maoist — he is very anxious about thought control," Willy Lam of the Chinese University of Hong Kong told the AP. "He definitely does not want people to be faithful members of the church, because then people would profess their allegiance to the church rather than to the party, or more exactly, to Xi himself." Experts say the government’s adamance comes from its view of Christianity as a political challenge and a form of western infiltration. "Chinese leaders have always been suspicious of the political challenge or threat that Christianity poses to the Communist regime," said Xi Lian, a scholar of Christianity in China at Duke University. "Under Xi, this fear of Western infiltration has intensified and gained a prominence that we haven’t seen for a long time." Xi has ramped up China’s defensive posture in practically every facet of Chinese life, not just religion. Information on the Mao’s Cultural Revolution, the Tiananmen Square Massacre, and other aspects of Chinese history are fiercely restricted even from scholarly eyes, while the "Great Firewall" strictly controls internet access. Xi’s government got Apple to remove virtual private network services from the Chinese app store, thus preventing citizens from getting around state censorship. Christians have also found that key retailers no longer sell bibles, while some localities explicitly ban children and party members from attending church services. Meanwhile, a church leader who attempted to register with the state said he was ignored and his church's property was seized. "We support President Xi," one church leader said. "All we ask for is a space for our faith." This entry was posted in Issues and tagged China, Religion, Religious Freedom, Xi Jinping. Bookmark the permalink.